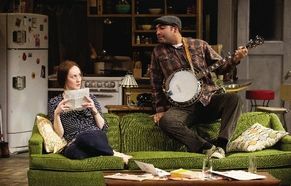 Directed by Juliette Carillo, The Sign in Sidney Brustein’s Window opened at the Oregon Shakespeare Festival on February 15 and will continue playing through July 3, 2014. OSF is a not-for-profit professional theatre founded in 1935; their season runs Tuesday–Sunday February through October in three theatres: two indoor stages and a flagship outdoor Allen Elizabethan Theatre. When you visit you can see one or two plays or up to nine plays in one week. For information about OSF, visit www.osfashland.org. Alton Scales (Armando McClain) is interested in the news in Iris’ (Sofia Jean Gomez) sister’s letter. Photo by Jenny Graham.